Mahindra Racing created something of a stir last year with their success at the Italian National Motorcycle Racing Championship (CIV). Not only did the team win races aplenty through the year, they also managed to win the championship title itself. One year onwards, they've proved that the success of 2012 was no fluke. The 2013 CIV championship concluded at Mugello last weekend and it was Mahindra Racing that was at the head of the championship standings once again, winning the title this year too. The team's riders Andrea Locatelli and Michael Rinaldi ended the season first and second in the championship, which means that it was a Mahindra Racing 1-2 finish in the Riders' Championship as well. 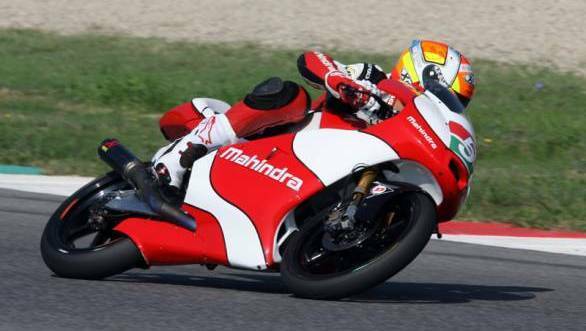 The Mahindra Racing team was a part of the Moto3 class, with 250cc 4-stroke motorcycles. Of the 10-round championship, Locatelli and Rinaldi managed several wins and double podiums, all of which aided their way to victory in the championship. The 16-year old Locatelli ended the championship with 167 points, ahead of his team-mate, 17-year old Rinaldi, who finished second with 145 points. Of course, Locatelli was pleased once the title was snagged, saying "We fought all the way through the season and finally we can say we're the Italian Champions!" Rinaldi, who had finished the final race of the season a mere 0.017 seconds off the podium declared that it had been "an amazing season." The rider also went on to congratulate his team-mate for winning the championship title. "This historic victory at the CIV marks a new high for Mahindra Racing in its journey towards becoming a global motorsports brand. Winning the Constructors Title for the second year in a row in this highly competitive series is also a remarkable achievement for Indian motorsport and we are very proud to have played our part in making it happen," said Anand Mahindra, Chairman, Mahindra Group.